Holy jumpin' Saints aplenty riding sideways on a candy pink fat boy, Telltale Games has FINALLY published the first season of Sam & Max on the Xbox Live Arcade. Coming a year and a half late, this downloadable console game packages all six of the first season episodes into one $20 chunk. That's just over three dollars an episode, making it the second best deal on the Xbox 360 (second only to The Orange Box). 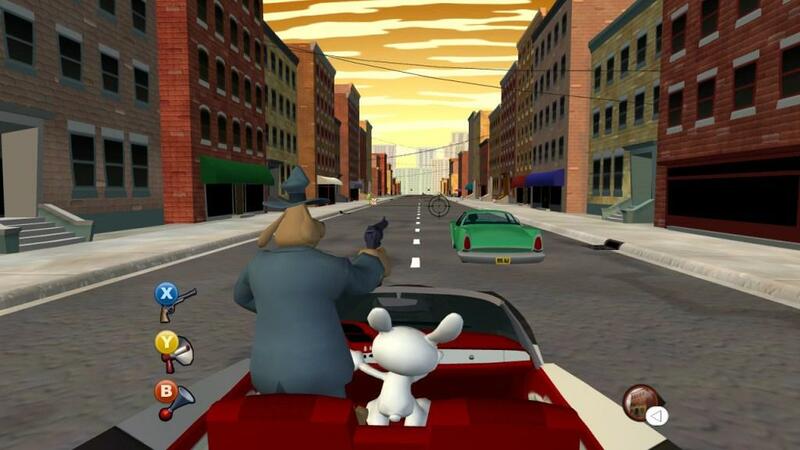 Not sure if Sam & Max Save the World is the right game for you? Then let me spend the next thousand words nagging you about how amazing this first season is. In case you have somehow sheltered yourself from famous video game comedy duos, Sam and Max are two freelance police officers (read: private investigators) who stumble through their cartoon world solving crimes and getting in to trouble (not always in that order). Sam is a giant dog who walks on his hind legs; he wears a trench coat and appears to be doing his best Sam Spade impersonation. Max, on the other hand, is a rabbity-thing and a loose cannon. The way he acts, the things he says, his whole devil may care attitude. It gives off the impression that either he has a wicked sense of humor ... or he's a sociopath that should be locked away for the rest of his life. Much like the original Sam & Max Hit the Road, this Xbox Live Arcade compilation is a point and click adventure game. That means, you move a cursor around the screen and tell Sam where you want him to go. You can also direct him to items you want to pick up, all of which will be kept in a storage box. From time to time you will need to aim your gun and even drive, but for the most part this is a tried and true point and click graphic adventure. If you've played Maniac Mansion, Monkey Island or any of the other SCUMM games, then you should feel right at home in Sam & Max Save the World. As the title suggests, our bumbling heroes have their hands full. The problem is, they don't know it just yet. The game's first episode (Culture Shock) features our heroes trying to solve a case that involves a colorful religion, brainwashing and child stars. Although there is a solid story found in the game, this episode is the way to get reacquainted with Sam and Max's neighbors and friends. But don't let the introductions fool you; on top of introducing all of the characters, it also introduces the mystery that will link all of these six episodes together. Next is Situation Comedy, the Sam & Max episode that takes on modern television. Yet again, this is a story about mind control, only this time around it involves you becoming the stars of a long-running TV show, earn a record contract and even win big on a game show. It all culminates into one of the wackiest sit-down interviews I have ever seen in a video game. 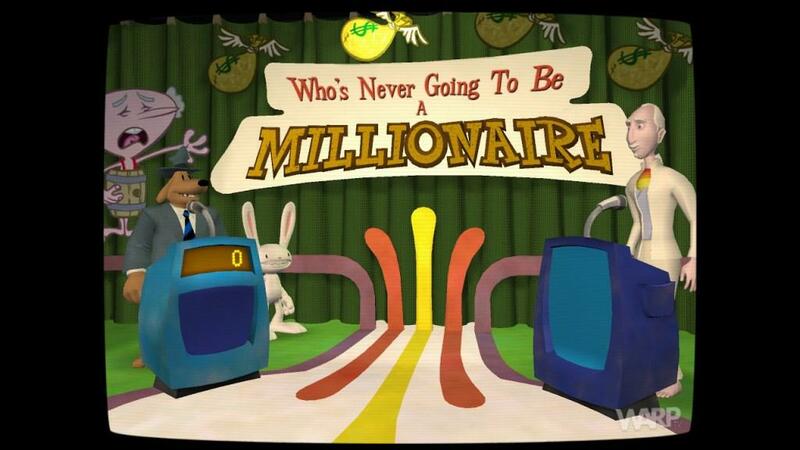 Situation Comedy proves that Sam & Max aren't afraid to take on the likes of American Idol, According to Jim and Who Wants to be a Millionaire? 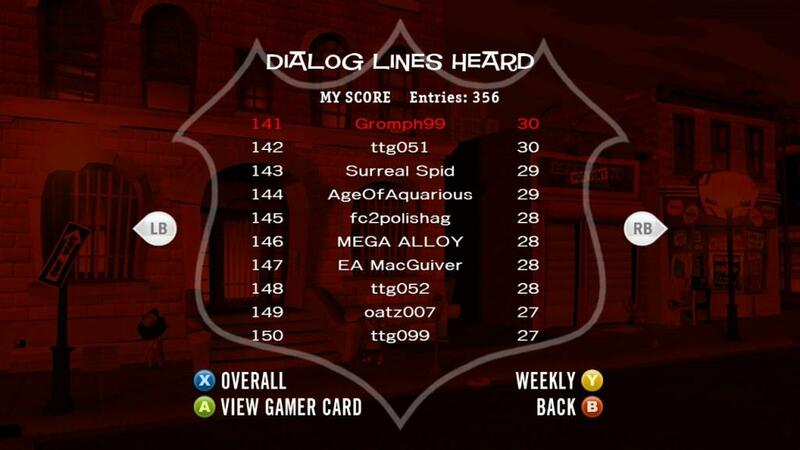 After taking on the major TV networks, Sam and Max get themselves caught up with the mob. In the third episode, The Mole, The Mob and the Meatball, our heroes have to win ten million dollars, recover a meatball sandwich, kill two friends and force a local business owner to stock hypnotic teddy bears. Wait ... hypnotic teddy bears? By now you should be sensing a theme. But do our private dicks? By episode four you should already expect the unexpected, which is why I didn't even bat an eye when I saw the title Abe Lincoln Must Die. If you're going to take on TV, the mob and child stars, then why not go after politics? This episode has you speeding your way to and from Washington, D.C., solving mysteries and ... debating Abraham Lincoln? It's true. This is one messed up episode, complete with a musical dance number that will knock you to the floor. Unfortunately this is also one of those episodes I can't say much about without spoiling everything. Needless to say, with a name like Abe Lincoln Must Die, you're about to play something extra special. 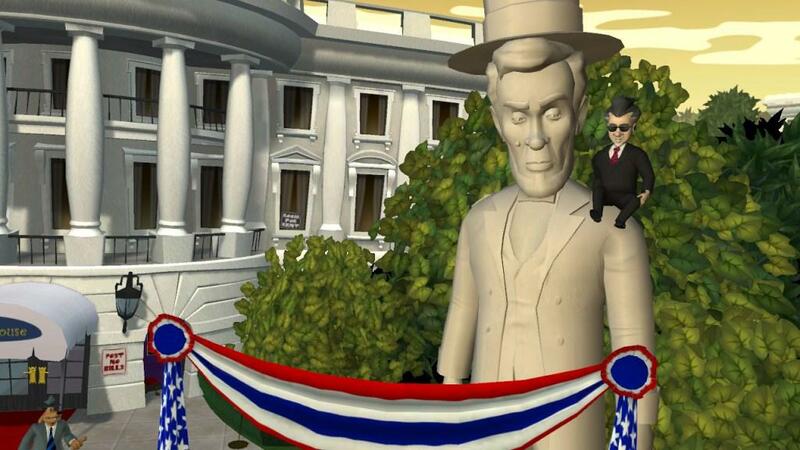 While I can't say much about Abe Lincoln Must Die, I have no problem talking about episode five, Reality 2.0. This is, without a doubt, the single greatest Sam & Max episode of the first season. This is the episode that lampoons video games, quite effectively I might add. It makes fun of some of your favorite video games, including Super Mario Bros., The Legend of Zelda, classic LucasArts adventure games, Dragon Warrior, Castlevania, and many more. Before long you'll be introduced to the central hub of Reality 2.0, a small storefront that houses four memorable pieces of technology (a pong machine, an arcade cabinet, an old school computer, and a telephone). These four characters introduce you to the wild new world of Reality 2.0, a game that requires you to wear a fancy new headset that sees the world in a completely new way. In Reality 2.0 the world around you has been transformed into something straight out of a video game, and all of your favorite items have been turned into something a little bit more appropriate to a computer game. One look at Reality 2.0 and it's easy to see why nobody wants to go back to the boring old Reality 1.0. The truth is I could spend the next three pages talking about nothing but Reality 2.0. This is an epic episode that riffs on everything from text adventures to massively multiplayer online role-playing games. It completely changes the world when it needs to and gives us four of the most compelling characters I've seen in a video game. Reality 2.0 is worth the $20 alone, it's that good. I would hate to be the episode that has to follow Reality 2.0. The sixth and final episode in the first season is Bright Side of the Moon, an episode that can't quite live up to the greatness of the first five episodes. That's not to say that the finale is bad. After all, it does have full resolution and a bad guy to take out. The problem is, after spending hours making fun of video games, jokes about Scientology don't seem as clever. As usual Sam and Max are asked to do take part in a lot of crazy situations, such as taking part in a game of Tic Tac Doom (a video game that is supposed to have the world's best artificial intelligence), perform a rat in the hat magic trick, and fix up the disembodied head of Abe Lincoln with Sybil (who is coincidentally the Queen of Canada). The problem is, a lot of it feels like it's just going through the motions. Perhaps Telltale Games should have ended the series with Reality 2.0. Oddly enough, it's not the mysteries or the puzzles that kept me coming back for more. The brilliance of this game lies in its characters, especially the supporting cast. I couldn't wait to see what Bosco was paranoid about from episode to episode. And don't even get me started on Sybil, a loveable character who has a new profession every time you turn around. I loved hearing the crazy things that Max would say and just living in this cartoon world. Even beyond the great stories and the puzzles you solve, it's the atmosphere that makes this game special. While it's recommended that you go through the game in order, you are not locked to starting on the first episode. If all you want to do is play, say, Reality 2.0, then you can skip ahead and just play that episode. You may not understand what is going on, but you can play it nonetheless. Each episode will run you between two and three hours (maybe longer if you're really bad at adventure games), which means that this $20investment will have you playing for 12 - 18 hours (perhaps longer). There are a few incentives for playing through the game again, including achievements you may have missed. While this may not have the replay of a first-person shooter, I did have a good time going through the episodes a second (and in one case, third) time. Even if you only play through it once, there are enough jokes and fun puzzles to make the purchase well worth your time. This Xbox Live Arcade version doesn't really add anything new to the mix, so fans who played through the episodes a year and a half ago may not have much reason to pick this up. The graphics are now widescreen and HD, which really makes the world look good. Other improvements include actual car controls (a vast improvement over the clumsy way you steered on the PC) and the ability to turn on a bunch of subtitles. Sam & Max Save the World is one of the funniest games I've ever played, an adventure game that lampoons just about everything we hold near and dear in pop culture. And even while it's making jokes about the mob, politics and game shows, it still manages to be an exciting adventure game with a lot of puzzles to solve. By the time you've made it through all six episodes, you will feel like you really experienced something big. Maybe not important, but definitely big. 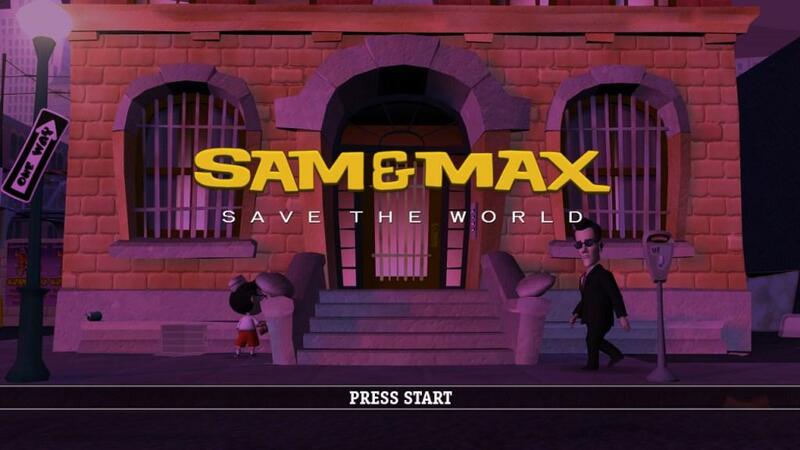 At just over $3 an episode, you would be a fool to pass up Sam & Max Save the World. Sam & Max Save the World is not just the funniest video game of the year, it's the funniest thing I've seen on my television screen in ages. It features clever writing, thought provoking storylines, huge mysteries and enough puzzles to keep you going for close to twenty hours. 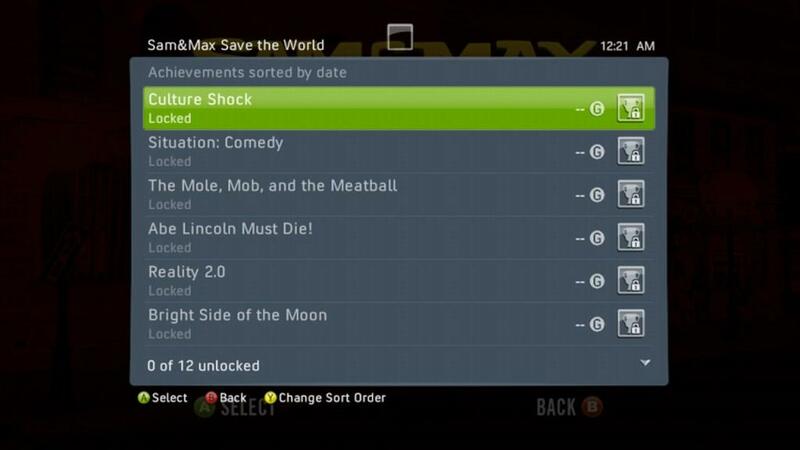 The only reason you could possibly have for not picking up Sam & Max Save the World is that you are an enemy of comedy!